Companies can use E&S QualityScore to identify areas that investors may see as presenting environmental and social-related risk and to inform their sustainability decisions. The E&S QualityScore offering for issuers provides premium tools to help companies stay abreast of emerging standards, peer practices, and shareholder priorities. 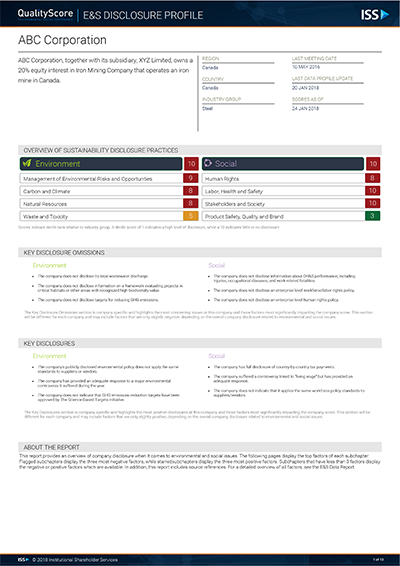 Premium users can benchmark their practices against peers and model the impact of potential changes in their environmental and social disclosures, thus gaining actionable insight on how to improve their E&S QualityScore rating. Environmental and social disclosures aren’t a one-size-fits-all proposition. Industry, company size, and peers are a few of the factors that can influence the environmental and social decisions a company should make. ICS’ expert advisory team understands these nuances and how to construct the right recommendations for you and your shareholders. The company universe covered under Environmental & Social QualityScore comprises approximately 5,000 publicly traded companies in the Americas, European and Australasia regions in all 24 industry groups. The ISS E&S QualityScore Technical Document details the questions analyzed and rationale for inclusion in the factor methodology. Companies receive two overall QualityScores assessed across two pillars: Social and Environmental. QualityScore uses a numeric, decile-based score that indicates a company’s environmental & social risk relative to its industry. A score of “1” indicates environmental & social risk in the lowest 10 percent of all companies, and, conversely, a score of “10” indicates governance risk among the highest 10 percent of all companies. Benchmark environmental & social risk and uncover opportunities to maximize your appeal to investors.